Broadway Roulette founder and CEO Liz Durand Streisand literally gave birth to her child just as her business came to life. Having that dual focus on the baby and Broadway Roulette created the perspective and balance to keep push past challenges and grow them both. Celebrity journalist turned CEO creating a new marketplace model to buy and sell event tickets. After a decade in the trenches of New York's entertainment scene, Liz saw the opportunity to pair expiring inventory to cultural events with consumers who were being bombarded by choice overload -- and Broadway Roulette was born. Broadway Roulette's key investors include Jesse Draper of Halogen Ventures and Randi Zuckerberg of Zuckerberg media. In 2018, Broadway Roulette was accepted to Morgan Stanley's Multicultural Innovation Lab, an accelerator focused on female and minority-led companies positioned to disrupt industries. Great article in the penny hoarder on getting free and discount theater tickets! You could even go to the Oscars!! One day I was at the box office in labor, but didn't know it, buying tickets at the box office. Two days later I was back at the box office with no baby, buying tickets again. And the box office manager, there's two that are women, the one who was at the window that moment looked at me and was like, what just happened? Where is your baby? Your listening to Financial Grownup with me, certified financial planner, Bobbi Rebell, author of how to be a financial grownup, but you know what? Being a grownup is really hard, especially when it comes to money. But it's okay. We're going to get there together. I'm going to bring you one money story from a financial grownup, one lesson and then my take on how you can make it your own we got this. Hey friends, it is summer time to get out and do some fun things, oh but that budget. Well, this show is for you wherever you live. I hope this inspires you to go to live theater or go to a concert or whatever you enjoy. Just get out because it can be affordable in part because there are more and more disruptors in the entertainment business, like our guest who heads up Broadway Roulette. Welcome everyone. Thanks for joining us. If you have not already, please subscribe to the podcast, we try to keep it to about 15 minutes to fit easily into your schedule. If you have more time, you can binge on, more episodes, especially if you're in a long car ride, going somewhere to visit friends. Maybe you're visiting some friends in New York. Our guests, Liz Durand Streisand knows all about that. Before she and her husband became parents, they had a lot of friends staying with them in their New York City apartment because they had something you don't hear about very often here in New York City, a spare bedroom. So their friends would come and they would want to see shows, but the big Broadway shows, the ones that they had heard of, we're always either sold out or ridiculously expensive. Fast forward, Liz and her husband came up with a way to disrupt the old Broadway discount model. Let's spend a money story with Broadway Roulette's Liz Durand Streisand. 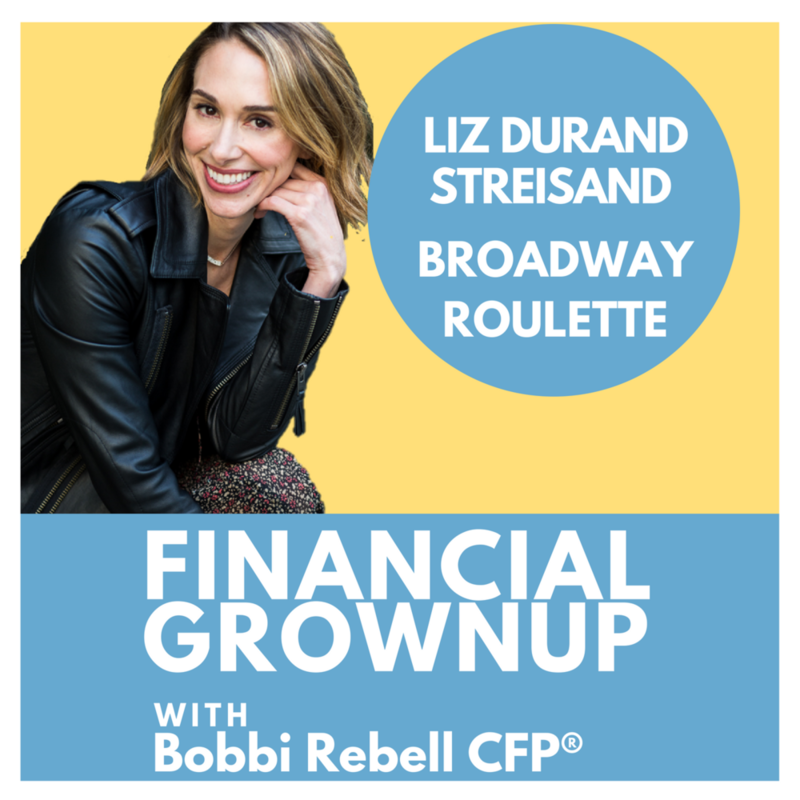 Liz Durand Streisand you're a financial grownup welcome to the podcast. Thank you for having me, so excited to be here. And I'm excited to learn more about Broadway Roulette. What is Broadway Roulette? Broadway Roulette, it's basically price Priceline for Broadway with only two levels of bids. So you go onto the site and tell us when you want to go and how many tickets you're looking for and set some basic criteria about the type of show you want to see or don't want to see. And then the morning of the show you get an email that's like, surprise this is the show you're seeing and all the tickets are a flat price, so you don't have to like negotiate with your friends or look for discounts are stand in lines. Love that. We're going to talk more about that in a minute, but I want to talk about your money story because it ties into Broadway roulette. This happens all the time I feel, people are going through major life changes in their personal life. They're having babies, they're getting married, they're moving. All these things are happening and that is exactly when the greatest business opportunity ever just drops in their lap. Tell us your money story. So I liked to be very orderly and very type A, which made me a good New Yorker for many years and I wanted to do things in the order that made sense and I saved 10% of my paycheck every month and did all that good stuff. I had a career as a journalist. I've been doing it for about a decade. I was very settled. It was very steady. And you're being modest, you were a very top entertainment journalist. Yeah I was probably like the most prolific entertainment journalist in New York City for a decade. I wrote for every major publication that anyone has read on their phone, on the subway, on the way to work, hoping no one is seeing the story they're reading about the Kardashians. That was me. But They loved to, and I actually really enjoyed it. And I would married. And then I finally was able to have a baby, which was very exciting, but at the same time that that happened HIS business that we had started kind of, not like as a joke, but as a hobby. It was sort of a side project just to see if anything would happen. And you know, two days after I gave birth, we landed this major contract with our first Broadway show and it was time to decide like go big or go home. He was actually in a very cushy family office job and it was about six weeks after I had the baby that he decided that would be a great time for him to leave that job and go basically be what I call a financial, a cowboy, to strike out on his own. And also in that time period this financing comes through. Yeah, it was right around the same time. We had been sort of casually talking to friends and family about, hey, would you want to give us money for this weird thing we built in our living room? And that none of us know really that much about. And it turned out that the answer was yes. We met with two, they were technically venture firms but they were friends and they both said yes within a few hours of meeting us and that kind of, the tide turned and all the checks came in and all of a sudden it was just time to go for it. And you know, the timing was terrible in the sense that it's like I was nursing every three hours. I had just had a baby, my husband had just left his job, but the timing was also the timing. That's when it was. So it was the perfect timing because that was the only time if I didn't say yes to that money then, they weren't going to come back in six months and say, "Oh, can I give you money now?" They're giving the money now. So now is the time. Wow. So what happened next? So you were, just to be clear, you're literally, it looks like you've got this massive company going on. You, Liz are going out and literally procuring these tickets. Yes. So like one day at the box office and I was in labor but didn't know it buying tickets at the box office. Two days later I was back at the box office with no baby buying tickets again and the box office manager, there's two that are women in Broadway and the one who was at the window that moment was a woman and she looked at me and was like, "What just happened? Where, where is your baby?" But I think that's just ... on one hand I was very out of sorts because there's just all the drama that you just had a baby. But on the other hand was actually really nice for me to have something that was like the anchor and a goal that was unrelated to becoming a mother. That was, I have this business that is growing that needs my attention and the act of like leaving my apartment and running around in 95 degree weather and buying tickets at the theaters and begging people to hold them for me, actually was something that was very familiar at that point. And it gave me a sense of stability during a time that felt like it could have been just like spiraling out of control. In a weird way it was actually nice to do something over and over that wasn't that enjoyable, but that I knew how to do. When you look back, what is your takeaway for the listeners? If they experience something like that? And a lot of people do. Not that situation, but the convergence of different parts of their lives at the same time. I think there's two things. I think it's important that you pick a life partner who truly sees you as a partner. Whether you want to pursue business or you just want to, do something else with your time. You want to work on charity, you want to take care of your kids. Having someone who's going to back you and they're going to back you, not because they necessarily agree with everything you want to do, but because they agree that you should be allowed to do whatever you want to do and you should use the corded is the number one thing. The second thing is just breaking big projects down into small manageable tasks. Like when you're sitting there and you're trying to nurse and the baby's not latching on and you haven't slept in like eight hours. It feels like that's never going to end and your life is never, this is going to be your future forever and I think it's important to break down that bigger thing into a smaller task like all I have to do right now is try for 10 more minutes and then I'm going to put the baby down and I'm going to go buy these Broadway tickets and when I get back I'll try again. And I'm going to give myself permission right now to not think that because this one moment didn't work that the rest of my life isn't going to work. You also have an everyday money tip that I had not really thought of. I've resisted doing this, but you made me think about it very differently and I'm really excited to kind of consider this. My money is if you are a woman with limited time, hire a stylist immediately. Unless you love shopping as an actual recreational pastime and it's something you do socially or you find it relaxing, cut it out. You don't need to be doing it. Hire someone the money you pay that person to accrue all the clothes for you, will be paid out in spades because they will number one, find things that are $25 that look like $200 or $2000. And number two, all that time that you would have spent trying things on at the store feeling bad about yourself, you can instead spend on something that is more valuable to you, like an extra hour at the park with your child or sending three extra emails that wouldn't have gotten done because you just wasted an hour at Bloomingdale's staring at 300 pairs of shoes and bought nothing. I know my hesitation is, oh, it feels so frivolous to spend money paying someone to shop for me, and then what if they make me buy things are too expensive. I don't want to spend that much money. I feel like there's a lot of reasons people resist that kind of thing. Well you need to find one who you're comfortable with who you can say to them, "I don't like this, I'm not buying it." But if you find the right one, it saves you so much time and so much money because you get an entire wardrobe that's like $25 dresses and then you have one handbag that goes with all those dresses that was a splurge, and now everything looks like it was a splurge. And I just think the emotional toll and the energy toll of shopping if you don't enjoy it, is so high. There's something to be said for outsourcing things so that you have time to work on things that add value. Like if you're not standing at Bloomingdale's, being miserable, finding things you don't like, that time can be spent on finding new clients. That time can be spent on something that generates revenue, that pays for the stylists, plus stylists are frankly not that expensive. They can shop in an hour, what it takes you, takes me four hours to find a dress that I don't really like, but I've finally given up because my friend's wedding is tomorrow and I need something. That's my shopping experience. My stylist in one hour, she's got me a wardrobe for the next six months. So where can people find a stylist? I think Instagram is a great place to go. As much as I have a love hate relationship with social media, I think if you find someone who's page you like who has style that looks like yours, that's a great place to go and find someone. It's also great to ask your friends because any of your friends that have really good style like that, I'd bet ne of them is using a stylist. A lot of people [inaudible 00:10:47] tell you unless you ask. It's like a dirty little secret. Whoa. Alright, let's talk a little bit more about Broadway Roulette. One of the many things that impresses me is that if I go to one of the traditional ticket booths to buy a discount ticket, the shows that I see on the board are often the shows that are having a lot of trouble filling seats. When I go to Broadway Roulette, the shows are the ones we all want those tickets for. How does that happen? Well, to be fully transparent, every Broadway show, except for the top like five average, have about 25% of their seats empty on any given night. There's very, very few shows that are actually sold out all the time consistently. The ones on the board in Times Square, which I affectionately call the wall of shame. It doesn't mean that they're terrible shows and it doesn't mean that you don't want to see it or that they have tons of empty etas, it means that the people that are behind that show have done the math and figured out that they'd rather have these seats sell at whatever price they're offering it there than have them go empty. There's other shows that decide they'd rather just not do that and not have their name up there and not have the seats all sell. So it is actually more of a management question then like a quality of the show question, but the way that our system works, we work directly with the Broadway shows. One of our big sales pitches to the show partners is, it's not an advertised discount or customers don't know what they're buying and so it protects your brand in a way that's very unique compared to like a big slash through it that says 80% off. And because our brand partners to us as a company that is sort of based on the concept of rising tide lifts all boats versus race to the bottom, we're able to broker better seats at cheaper rates than you can find on public discount. And the second part of that is that we make a conscious effort to include, we literally send people to every single show on Broadway regularly. And that's a marketing expense for us. And the reason we do that is that we're not primarily a discounter where a discovery platform. So there's tickets to Hamilton and Dear Evan Hansen and Hello Dolly and all the shows that you won't be able to see if you go to the TKTS booth, though I do think there's a time and place for that and no shade to TKTS. If you're not beholden to a particular show, this is a great way to see everything. And our customers do use our service over and over and over and we eliminate every show that you've ever seen through us every time you spin. So you can go 30 times and see 30 different shows. Which is also a great business model because it promotes loyalty. Yes it encourages repeat business. The thing I like about that part of the model especially, I mean really and truly is let's say we have a customer that we send to Miss Saigon that show's closed now, but let's say we send them to Miss Saigon. They have a great experience. That then prompts them to buy another ticket through Broadway Roulette. We then send them to, let's say, Phantom. We've now basically the experience that Miss Saigon has helped sell a ticket for Phantom. So our argument is that all the shows that work with us are helping each other versus competing for the consumer business. Perfect. Liz, where can people learn more about Broadway Roulette and about you? Well, you can learn about Broadway Roulette on our site, it's just broadwayroulette.com. It's simple fun and easy, which is sort of our sales pitch. And the best place to follow me is just my Instagram account, which is just Miss Durand. Lot's of cute pictures, if don't want to see cute pictures of the child don't follow my Instagram. Cool. Well thank you so much. So Liz's story resonates on so many levels, but let's start with the one that's the most fun, which is getting tickets for what you want for less money. Financial Grownup tip number one, just because you don't have a big budget doesn't mean you can't see big shows. First of all, Broadway Roulette, as we discussed, is a game changer. But I'm also going to give you some other options, all of which have pros and cons. Obviously with Broadway Roulette you can see the best shows for less, but you do give up some control. Personally, I think that for as little as 49 bucks a ticket, that is part of the fun, but okay, maybe you're just in town for one night and you want to see a very specific show. You want another option. Most Broadway and off Broadway shows sell rush tickets and they also have lotteries. Some are online and some you do have to go in person. They can run for as little as $10 as is the case of Hamilton. Most are around 40 bucks, but yes, you can see Hamilton for as little as 10 bucks. You've got to be really lucky though, but it's there. Broadway shows also have standing room tickets. They are often under 30 bucks. Also look for student and active military discounts. Links that will tell you all the details for each show are going to be in the show notes. Financial Grownup tip number two, better than discount is free. Free entertainment this summer, there's also free theater in many cities. For example, right here in New York City where I live, we have free Shakespeare in the park. So you can wait in line, got to get up early, but you can also enter the online lottery. So if you've got to be at work, it's okay. Just remember to do this. I've always been able to get tickets at least once per summer. You may have to try a bunch of times, but you know what? Just set a reminder on your phone to enter each day and you're good to go wherever you live there are opportunities. One option, for example, get social. Follow the venue on social media of what you want to see. Sometimes if a theater isn't full, they will actually offer free or heavily discounted tickets to followers. You can also see things for free if you're willing to volunteer at a theater, maybe ushering or doing various other jobs to support the production. One thing I've yet to do but I hear about and I'm so curious about is being a seat filler. I'll leave links in the show notes, but basically you attend show tapings or live musicals or plays so they don't have empty seats and the stigma that goes with them. Alright. Thank you all for spending your time with us. It means a lot as do the social media DM's and shares that we've been getting. Please be in touch. I am at Bobbi Rebell on Twitter. And Bobbyrebell1 on Instagram. And if you're coming to New York, try Broadway Roulette. You can book up to three months in advance and if you follow them on social, they do freebie giveaways. Just saying. Thanks Liz for sharing the story of the birth of your business and your baby and for helping us get one step closer to being financial grownups. Financial grownup with Bobbi Rebell is edited and produced by Steve Stewart and is a BRK media production.